Data types Every table field has a data type that restricts what users can enter. For example, a Date/Time field accepts only dates and times, a Currency field accepts only monetary data, and so on. Field properties Some field properties restrict data input. For example, the Field Size property of a field restricts input by limiting the amount of data. Input masks You can use an input mask to validate data by forcing users to enter values in a specific way. 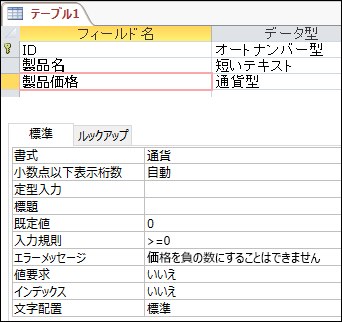 For example, an input mask can force users to enter dates in a European format, such as 2007.04.14. Field validation rules Use a field validation rule to check the value that you enter in a field when you leave the field. For example, suppose you have a Date field, and you enter >=#01/01/2010# in the Validation Rule property of that field. Your rule now requires users to enter dates on or after January 1, 2010. If you enter a date earlier than 2010 and then try to place the focus on another field, Access prevents you from leaving the current field until you fix the problem. Record validation rules Use a record validation rule to control when you can save a record (a row in a table). Unlike a field validation rule, a record validation rule refers to other fields in the same table. You create record validation rules when you need to check the values in one field against the values in another. For example, suppose your business requires you to ship products within 30 days and, if you don't ship within that time, you must refund part of the purchase price to your customer. You can define a record validation rule such as [RequiredDate]<=[OrderDate]+30 to ensure that someone doesn't enter a ship date (the value in the RequiredDate field) too far into the future. 検証規則には、式 (単一の値を返す関数) を含めることができます。 式を使うと、計算の実行、文字の操作、データのテストを行うことができます。 入力規則の式でデータをテストします。 For example, an expression can check for one of a series of values, such as "Tokyo" Or "Moscow" Or "Paris" Or "Helsinki". さらに、式は数学演算も実行できます。 たとえば、式 <100 を使うと、100 未満の値を入力するよう制限されます。 The expression ([OrderDate] - [ShipDate]) calculates the number of days that elapsed between the time an order was placed and the time it shipped. LIKE "[A-Z]*@[A-Z].com" OR "[A-Z]*@[A-Z].net" OR "[A-Z]*@[A-Z].org"